Uplifting lemongrass deeply cleans face and body while promoting healthy looking skin, helping you start and end the day right. Other active ingredients include peppermint, tea tree and thyme. This gentle cleansing formula leaves no soapy residue and is free of sodium lauryl sulphate. It’s safe for you and the environment too! This gentle antibacterial cleanser is perfect for all skin types including acne prone skin. Lemon - Helps oily complexions, skin impurities and infections. Lemongrass - Counters oily hair, skin and acne infections. Lavender - Antiseptic, excellent cleanser and effective for all skin types. Cedarwood - An astringent for oily skin, acne and dandruff. Thyme – Antibacterial, antiviral, antiseptic. Rosemary - Natural astringent and helps reduce acne inflammation. Ingredients: Aqua (Deionized water), Decyl glucoside*, Cocomide MIPA**, Glycerin*, Polysorbate 20**, Cyamopsis tetragonolobus gum (Guar gum), Xantham gum ( Corn sugar gum), Citrus limonum (Lemon), Cymbopogon citratus (Lemongrass), Mentha x piperita (Peppermint), Origanum vulgare (Wild Marjoram), Cinnamomum zeylanicum (Cinnamon), Hydrastis canadensis (Goldenseal root), Cedarus virginian (Cedarwood), Melaleuca alternifolia (Tea tree), Lavandula angustifolia (Lavender), Rosmarinus officinalis (Rosemary), Thymus vulgaris (Thyme), Retinyl Palmitate (Vitamin A), Glacial clay. I've been using this as a face cleanser for years. It is the best I've tried. I love the smell too! I love the Aroma Crystal Therapy product line, and this is a definite favourite. I use the body wash also as a face cleanser. It takes all makeup off better than any cleanser that I have ever tried -no need for a makeup remover. The aromatherapy alone is worth the purchase! I keep buying this. I use it for face soap. It cleans very well and doesn't feel like it dries my skin, although I still do use Green Beaver Green Tea facial cream, which I also really like because it feels moisturized without being oily. This is the best body wash I have found for my skin. I really love the scent because its so different from other body washes. My skin has calmed down so much since using this. I find its a bit on the expensive side, but since it works - makes me feel a bit better about paying that much! Of all the body and face wash products I have used this one is the most gentle on my skin. Although I LOVE gardeners dream cream this is not my favourite. The scent is so little in comparison to their other products which I use a lot of!! Nothing particularly wrong with the product, but also nothing particularly great about the product. When on sale I buy, otherwise not my favourite item from this group of products. Her other items are wonderful!!! 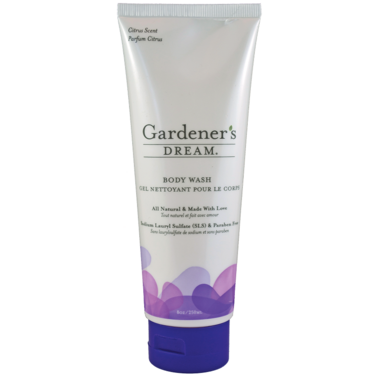 Love the smell and feel of this body and face cleanser! Leaves the face feeling fresh and clean, without being stripped. Good value for the price. Would definitely buy again. This is my new favourite facial cleanser. It cleans the skin well, without drying it out. The gel is nice, and you don't have to use very much, so the tube lasts a long time. The scent is fine, and this is a natural product, without harsh chemicals. This is a great facial wash. It leaves your skin feeling clean without feeling dry. If you don't like the smell of lavender stay away from this one. The only reason I won't be repurchasing this is it stings if it gets in your eyes. Even a drop is enough to cause some serious stinging. I'm going to finish the bottle as a body wash. Doesn't work as well as I thought it would. Smells great though. Love this product!!! Mild enough to not irritate my sensitive skin like most cleansers and doesn't overdry my skin! It'll be a permanent fixture in my bathroom cabinet!! Love it!! Waste of money! Does absolutely nothing for face acne or body acne! Great facial wash,i love that its 100% natural. This cleanser was not particularly compatible with my facial skin, but I do like it as a body wash...and sometimes I use it as shampoo. Produces a nice lather and smells of fresh herbs(mainly lemongrass). Really like this cleanser. Love the natural smell of all the different essential oils in it. It did dry my skin a little but I tend to forget to moisturize after cleansing because I have oily skin. I only use this on my face.....with the price it's not something I want to go through quickly by using it as a body wash too. 3.5/5 This product works very well to cleansing my acne prone and sensitive skin. It has a great lather and you only need to use a very small amount, so it is good value for your money. The only negative thing I can say is that I find the lemongrass and peppermint scent to be a little strong for a natural facial cleanser. I wish it was scent free. Pretty good cleanser for sensitive, combination skin. Doesn't dry out my skin, and in conjunction with a toner and AHA products has helped clear up my skin. Before this I was using a "Brand name" acne treatment system (Murad) but it really dried out my skin. Love this as a body and face wash. It leaves the skin feeling very clean without containing harsh surfactants, which always make my skin react badly and I believe it has made my breakouts increasingly mild and easier to deal with. I have now used this for a few months and repurchased. In my opinion the price is reasonable for the quality of this cleanser. Really amazing product, worth the money. I use it as a facial cleanser and my skin feels cleaner than with anything I have used before. I use it with Morning Dew Moisturize and my skin feels soft, and not greasy. My daughter (age 20) noticed a difference with her troubled skin immediately, and after using it just one month, her skin hasn't looked this good since she was 10 (that is, before acne). We both highly recommend it! This Face Wash REALLY WORKS! I have mature skin that still breaks out (face, chest, back) and I love this stuff. I'm glad to see it offered here as it's hard to find other than the West Coast. I use this as a face wash - it is a perfect match for my sensitive skin and leaves it fresh and clean. After I use a toner, I rarely see much residue left from makeup etc. on my cotton ball that this cleanser didn't get rid of. A fantastic more natural alternative - that certainly has a higher vibration. I've had some limited success with this product, which is much more than I can say for any other acne wash for body - and I've tried most of them. The scent is very herbal, but refreshing and doesn't linger after you've rinsed off. Leaves skin feeling squeeky clean without being dry. Great for sensitive combination skin. Refreshing natural scent, lathers up perfectly, really feels like it's cleaning but doesn't strip the skin, leaves my face feeling fresh. I use the green beaver green tea facial moisturizer after and it's a great match. It made a significant difference with my acne! It's great, and not too expensive. I don't mind the smell. My skin does get a little dry after but nothing a good moisturizer can't handle! The scent is not as cloying as their other products, but although it spreads well and leaves you moisturized immediately after the shower, my skin became very dry and itchy about a 1/2 hour later, which progressed to a skin rash. Would not recommend this for sensitive skin. This cleanser is pretty effective and I use it for my body. Love this cleanser! was using proactiv and found this to be more efffective and much cheaper! I'm really impressed with this product. It makes a really rich lather and smells great. It gets my skin clean but doesn't dry it out. It's also a huge bottle so will last a long time. I have very sensitive skin works very well without irritating my skin. What I love the most is that I can clean my face and body with one cleaner! I love love love this product! You only need to use a small amount (about the size of a quarter or even a nickel) for your whole body. My skin feels soft and clean after I use it and never 'residue-y'. I have sensitive skin as well as a skin condition called Kerotosis Pilaris and this product does not irritate my skin in any way in fact I have seen an improvement in the overall tone and smoothness. Really love this one - it cleans very well and leaves you feeling fresh. I love that its natural and it lasts a long time. I love this Face & Body Wash so much, I love the scent and the way my skin feels super fresh afterward without the chemical "tingling" other cleansers give. I also feel great about buying it because it is all natural, non-GMO, made in Canada and has the added benefit of being made with LOVE. All you need is a little drop to get a really good lather, so it lasts a long time! This is an excellent product! I had been suffering from acne for months and nothing was clearing it. I tried this and I noticed an improvement after the first day! I highly recommend it!